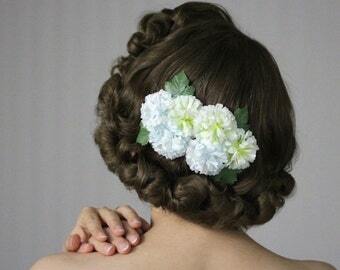 Small Flower Clips, Teal Floral Hair Clips for Women 1950s Hair Accessories Green Blue Tropical Vintage Pinup Hair Fascinators - "If by Sea"
These bubbly, small flower clips are made from actual reclaimed vintage millinery supply. 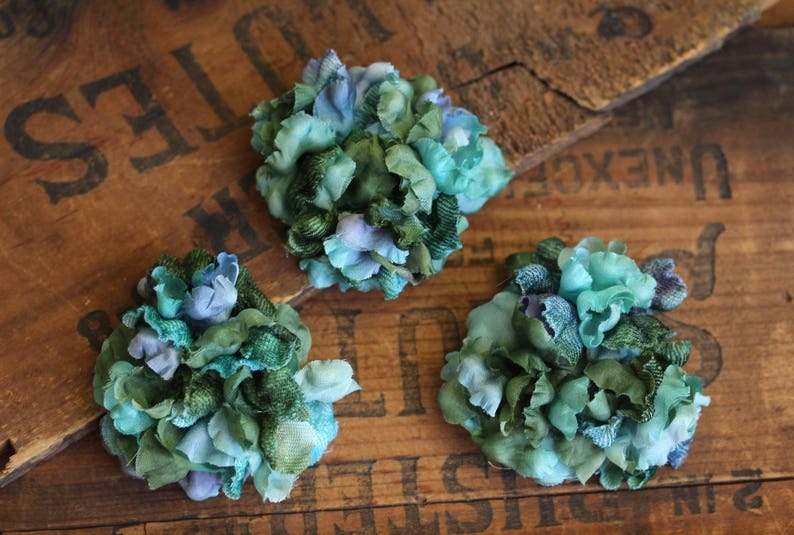 Three individual embossed silk pompon blooms clips in a gorgeous mix of deep green, aqua, and lavender blue create a teal mélange when seen as a whole. Wear them individually, clustered, or in an arrangement of your choice! > Note: Each set will be slightly different as these were made by hand. There are two small inner slits in the felt backing of each bloom where you can slip out the clip and move it to the other side (this aids in styling on either side of the face and if you are right or left handed). 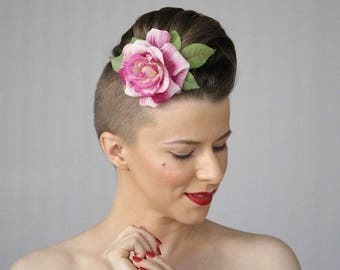 There are also two openings in the outer felt rims where you can slide through a thin headband to use instead. 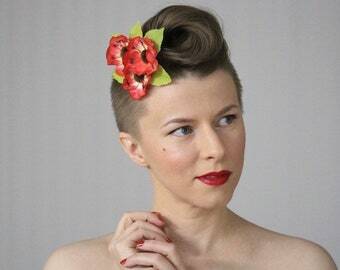 Floral Hair Clips for Women, Flower Headpieces, Pink Hair Accessories, Blush Flower Fascinator Headband, Vintage Style - "Dewspring Berry"
Tropical Hair Clip, Red Flower Fascinator, Vintage Headpiece, 1950s Hair Accessory, Red Floral Hair Clip, Chartreuse Headband - "Maui Muse"
Turquoise Headpiece, Blue Leaf Headband, 1950s Hair Accessory, Vintage Fascinator - "Sea & Sky"
Floral Fascinator Clip Purple Flower Headband Lavender Hair Accessories 1950s Convertible Hair Clip Tropical Clematis - "Byzantine Twilight"
Lilac Fascinator Flower, Purple Hair Clip, Lavender Headpiece, Floral Headband, 1950s Hair Accessory Winter - "Iced Enchantment"
Purple Hair Flower, 1950s Hair Accessory, Floral Headpiece, Vintage Hair Clip, Dark Purple Fascinator, Retro Dahlia - "Midnight Masquerade"
Another wonderful flower from ChatterBlossom! These are particularly adorable as they’re a set of 3, so you can wear as many or as little as you want! Colors are gorgeous, too. 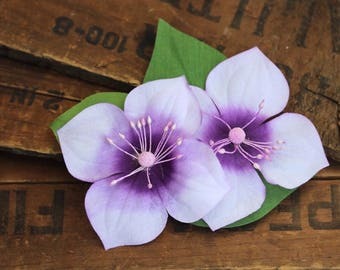 Columbine Floral Crown, Blue Flower Hair Garland, 1950s Hair Accessory, Hair Flower Clip Headpiece Wreath - "Doorway to Dreams"
1950s Hair Accessory, Coral Flower Clip, Small Hair Flower, Pink Fascinator, Floral Hairpiece, Vintage Headband - "Summer's Blush"
Large Flower Clip, Lily Fascinator, Purple Floral Hair Clip, Vintage Headpiece, Pinup Hair 1940s, Ultra Violet Magenta - "Stars in Her Eyes"